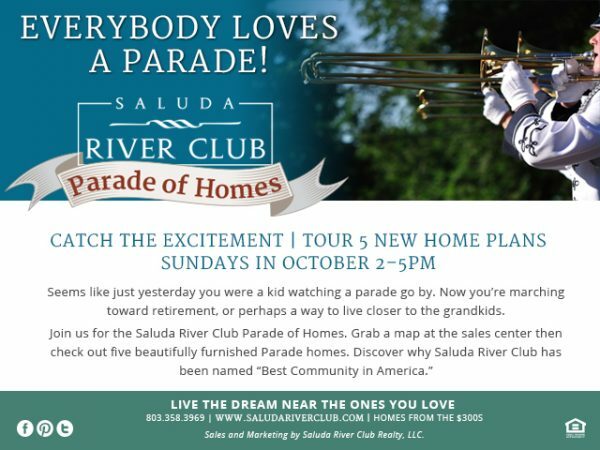 Every Sunday during the month of October 2015, Saluda River Club, the Midlands’ award-winning residential community nestled along the Saluda River, will host a Parade of Homes, welcoming in particular those home buyers who are looking for their perfect retirement home, or for a place closer to their (grand)children. “It seems like only yesterday that you were a kid watching a parade go by. Now you may be marching toward retirement, and you are ready to come live your dream near the ones you love!” says Lisa Smith, Marketing Manager with Saluda River Club. With three distinct neighborhoods and homestyles that meet the needs of singles, couples, families and empty nesters, Saluda River Club has become South Carolina’s most successful new home community. For active adults who are looking to retire and start a new chapter in their lives, Saluda River Club is a smart choice. Moving here is all about right-sized, no-maintenance living in a community that offers a wide array of amenities. Take a look at the many fun and well-designed Saluda River Club amenities here, such as the glistening pools at both the Chickawa Outdoor Center and the Village Clubhouse (for adults only). Miles of paved trails meander through all three Saluda River Club Districts (the River District, the Village District and the Woodlands District), and there is also a beautiful nature trail system. Activities for the whole family may include fishing, swimming, bike riding and nature walks, family campfires and more. Saluda River Club Parade of Homes: Sundays, October 4, 11, 18 and 25, 2015 from 2 to 5 pm. Maps of five beautiful Parade homes are available at the sales center. For more information or directions, please call 803-358-3969 or visit www.saludariverclub.com.